I made her a dress from left over linen from this dress. I wanted a cool summer dress for her that have a small, fitted neckline. She’s allergic to sunscreen and overheats easily. So a thin material with a good coverage is in order. I made it snap botton closure on one shoulder & side for easy on and off, and used self bias tape to enclose all the visible seams and french seamed the not visible seams. It is so satisfying making her this quick dress and the snap machine my dad bought me came in very handy. This entry was posted on Monday, June 3rd, 2013 at 12:30 pm	and posted in finished pieces. You can follow any responses to this entry through the RSS 2.0 feed. hahaha, i *wish* that is my toy storage. 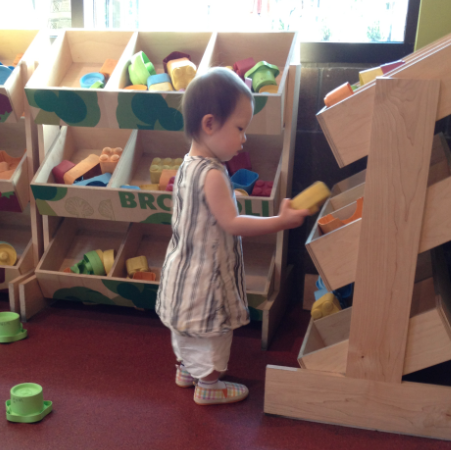 we were actually at wholefoods – they have a children’s section and she loves playing there. actually, we cleared our living room of any TV/electronics cos I didnt want to put up gates. so how the living room is just 2 couches and her toys, not really organized too. but much easier- i dont have to worry about her touching stuff she shouldnt touch! She is too cute! It looks like the dress is just perfect for her and summer days! Adorable. (Oh, yes, the dress too.) And already such a pro at modelling. 😀 thanks, she’s a natural! ‘Peasant girl dress’ is the purrrfect name for it! Adorable. I can’t wait til my toddler can actually walk so she can wear things without it being dragged under her knees as she crawls. i just googled it, looks like an interesting movie! 🙂 i agree, that color combo looks very good!